Every August, Gallup, New Mexico plays host to Native Americans from across the United States in a massive Inter-tribal ceremonial. The Indoor and Outdoor Marketplace and the Ceremonial Showroom present the country's most complete and varied displays of genuine Indian fine arts, including Navajo rugs, katsinas, jewelry, pottery, and basketry. There are socials, rodeos, and parades. Inter-Tribal events run from Wednesday through Sunday. Events Friday, Saturday and Sunday run primarily 9 am - 10 pm but check the schedule before going out to Red Rock Park. Gallup is located east of Albuquerque. Most of the Inter-Tribal events take place at Red Rock Park, 7 miles east of Gallup. With the exception of the parades, the majority of events take place at Red Rock State Park. There are several arenas and sometimes events are concurrent. Red Rock State Park is easy to find. Just travel east on old Route 66 out of town and you will see signs for the park. While you are there, marvel at the beauty of the red rocks and Church Rock in the distance. To see the best of the Inter-Tribal plan to attend for several days. Friday, Saturday, and Sunday may offer the best events for visitors. Look forward to Indian Dances, Ceremonial Parades, Rodeo, and Exhibit Hall and plenty of Native American Arts and Crafts. There is so much going on during Inter-Tribal. 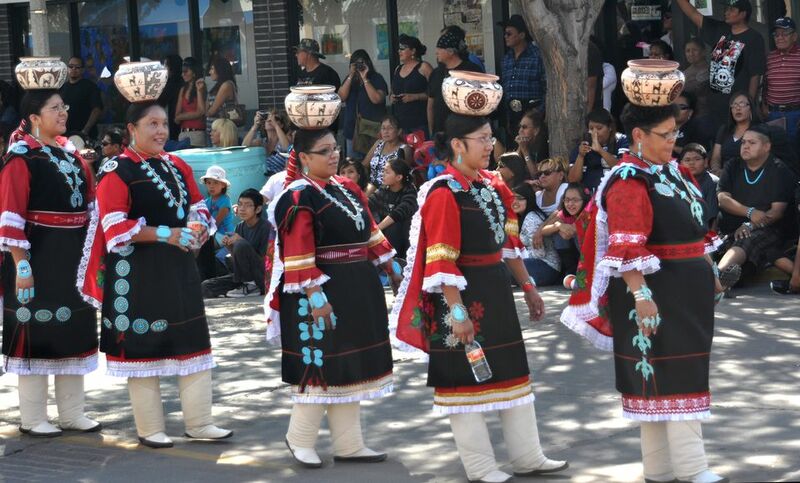 There are an evening parade and a day parade in downtown Gallup. Trading Posts offer great discounts. If you want to attend a ceremonial that offers culture and color, great local art, exciting dance competitions and an opportunity to learn more about Native American cultures, Gallup’s Inter-Tribal Ceremonial is for you. If you want to experience crowds, marketing hype, highly polished acts and boutique type shopping, skip Gallup. Gallup’s Ceremonial is for those who are respectful of and open to learning about Native American cultures. Ceremonial is not necessarily for tourists although the event attracts visitors from all over the world. It is a gathering for the peoples of the Southwest… the Navaho, Zuni, Hopi, and their guests from other tribes. Much of the pageantry comes with great history and tradition. Attend Inter-tribal with a desire to learn and you will come away enriched. For a first time attendee, there are some things to figure out. Get the scoop - When you get to Gallup, go to the Chamber of Commerce or one of the main trading posts and pick up an Inter-tribal Ceremonial publication with schedule, map, and articles. And, remember that if you see an event in black and white, it may be subject to change. Timing is flexible and you should be too. Bring money - In addition to the parking and entry fees, note that Rodeo events are extra. There are great food vendors. Try the Navajo Tacos and Zuni fresh baked bread. And, there is great shopping! You can visit the vendors outside the exhibit hall and shop for award-winning art inside. So bring money. Credit Cards are not necessarily accepted. Your purchases will support Native American arts and crafts. Mix and mingle - There are opportunities to quietly mingle with the Native Americans who know so much about their own cultures and about Inter-Tribal. Take time to talk with the vendors and artists about their work. Attend an event that you would enjoy at home. And at the Pow Wow competition, learn from those around you.